Barry Fredson has actively practiced law in New York and New Jersey for nearly five decades. He is Certified by the Supreme Court of New Jersey as a Civil Trial Attorney and he has argued multiple cases before the Supreme Court of New Jersey and the Appellate Divisions of the Supreme Court of New Jersey. He has tried over 100 cases to conclusion and he has served as an arbitrator for the New Jersey court system, for private organizations such as the American Arbitration Association and on behalf of other attorneys who represent individuals who have been injured in accidents. His experience is extensive within the New York and New Jersey court systems. 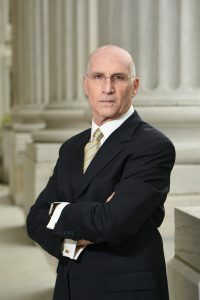 He is the senior partner and founding member of Fredson Statmore Bitterman. He has lectured in New York and New Jersey for various bar associations and organizations and remains an active member of Fredson Statmore Bitterman. He is also admitted to practice in the United States Court of Appeals for the Second Circuit, the United States District Court for the District of New Jersey, the Southern District of New York and the Eastern District of New York. He is the winner of multiple awards going back to his law school days.